I developed my evolutionary tree over the winter of 1987/8. There were also some tables then produced the winter before pretty much in their infancy. These were at first produced on 8.5×11 sheets, but to compress more data on a sheet I converted to 11×14 sheets of paper. The printer was one of the wide printers (“antique” we now call them) that used daisy wheels. For those of you who have been in the PC world for a very long time, this printer worked off my Sanyo MBC550, 4kb hard drive, with two 5 1/4″ floppie readers DSSD/DSDD (I paid a lot for the second reader), a CPM/SYS installed, an exceptionally small DOS, with SBasic as the programming language. I then took those 11×14’s to the photocopy shop and reduced them to around 68-70%. These were the handouts for my classes. I spent the next 2 years adding columns (ethnobotanical uses) and rows (genera) to these tables. They were developed using Order as the major page category, with families as subcategories; of course some families were exceptionally long and took up as many as 7 pages (i.e. Leguminosae), with approximately 45-55 genera per page. I catalogued the data from a number of ethnobotany-type dictionaries I had on plants, tallied up the results each year for presentation during my course. The point of doing this was to determine if there was a relationship between taxonomy, chemistry and ethnobotany. Now any of us familiar with ethnobotany in detail know there are taxonomic relationships between different plants and their uses. The point here was to see just how much these uses overlapped between genera in a single family, families in a single order, orders across subclasses, etc. The second goal was to see if there were some uses for plants that could be considered evolutionary in nature, such as high levels of use of toxicity placed higher up on the taxonomic tree, thereby suggesting its relative might also bear some interesting chemicals, interesting side groups or side products of synthesis and thus new uses yet to be discovered. My lab work on the benzylisoquinoline alkaloids had already given me some of the input needed to understand what I’d be doing here with these charts and tables. The biqs show us that as plants increase along the taxonomy tree, alkaloids increase in complexity and toxicity. It is not unusual for an alkaloidal class to start with some fairly simple toxins, or even non-toxic chemicals, only to evolve over time more complex chemicals with greater degrees of toxicity as the Order-Family-Subfamily evolved over time. In this way, the bitter alkaloid get supplemented by new alkaloids that are selectively toxic, followed by even more toxic compounds that are even more selectively toxic, followed by compounds that are very selectively toxic, so toxic they work at some intracellular level, versus the predecessors that work at the cell membrane, tissue or superficial histological and anatomical level. As evidences by the complexity of the opiate receptors (their polypeptide nature), it took the plant several generations of biq development to produce the alkaloids reactive with these receptors. As evidenced by the cancer drugs in the Berberidaceae and Papaveraceae, there had to be supplementary reactions upon the basic protoberberine biqs developed in order for a plant to produce an effective chemical that works at the nucleic acid level (the evolution of berberines to naphthaquinones, through the addition of side groups, -O-Methoxy groups, and additional electron pair resonant end rings). This statistical evaluation of plants has been through the bulk of the steps detailed in the next flowchart. The table production is the first nine steps. About 12 years ago I decided it was time to apply GIS to this work, designing my own taxonomy chart on the GIS, using this system to “map out” the information on ethnobotany and plant uses. It was one thing to produce a chart that displays all of these evolutionary relationships; it was another to produce a chart that you could selectively overlay data upon in order to demonstrate the evolution of fixed oils into their more complex structures and evolution-based uses, of the demonstrate how two pathways merging at a specific point in the Plant Kingdom are the cause for the most unusual poisons to be developed. Since the chart is an evolutionary tree, implying more primitive at the bottom and more advanced either at top, along the outer edges, or at the end of long branches, it also could be use to see how the processes in chemical synthesis tend to change as a natural part of the evolutionary process. In some cases, there is little relationship between a compound and its place in the evolution tree, such as coumarins. This is due to the fairly basic nature of the pathways used to produce these relatively small compounds. 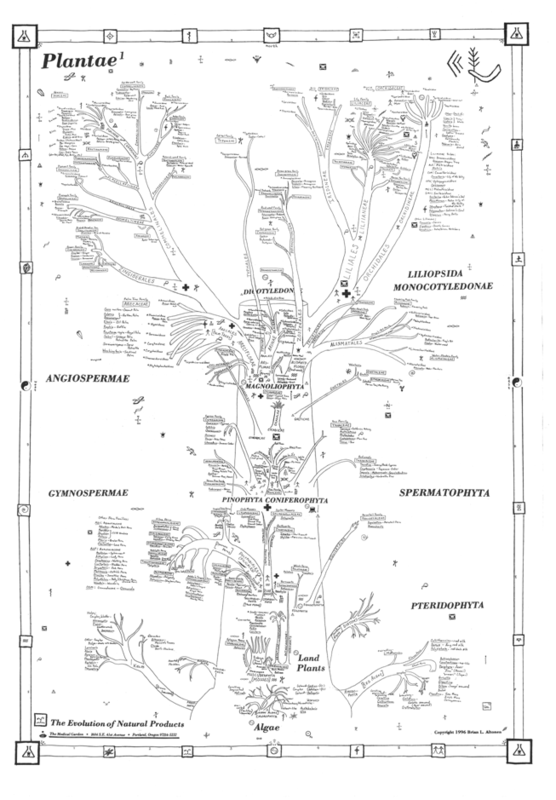 The most advanced coumarins are going to be with some of the more advanced hierarchies of families, like the pyranocoumarins and furcoumarins evolved much later in the Rosidae, versus the fairly primitive simple structured coumarins of the Berberidaceae-Podophylloideae. [This chemical evolution process itself is detailed on other pages.] If we look at the fixed oils, we find short chained fixed oils prevalent in the paleobot section, with increasing chain length developed due to evolution and climate change, with the most modified fixed oils found at higher levels in evolution, serving as toxins rather than as a form of energy storage or chemeical used in the production of some structural feature. These findings suggested to me the value of the tables of plant uses. The most useful application of these tables to date has been in the prediction of possible plant compounds that are still out there yet to be discovered, and the explanation as to why some plants of the past had ethnically defined values, values which today we know nothing about. For example, one day back around 1990 I received a call from an anthropologist in New Mexico. She had heard about my course because one of her students had taken it, and she had even seen the book I wrote up for the course back then. She called to ask me if I could give her a lead as to the use for a particular plant found at an American Indian site. 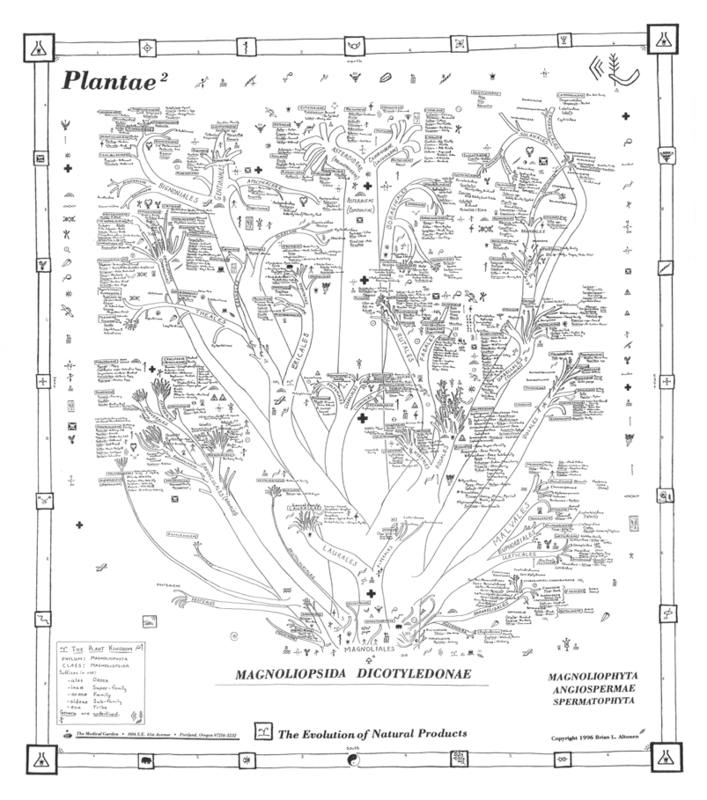 This led me to pull out my prototype of the Plantae: a Collection of Ethnobotanical Tables book (link below) and look up the plant’s family and associated families. Based on the Family-Order I could tell her that the plant was most likely either edible, a dye source, or some sort of unique medical plant due to the history of uses for its genus and many of its closest relatives. It ended up this plant was eaten as a grain source, and had a unique compound in it that worked as a vermicide. Once I merged all the genera into a single database, and developed automated calculators to analyze the details on these plants as new genera were added, I began plans to develop the ways to illustrate these results, without having to constantly run updates or rehashes on the data entries. 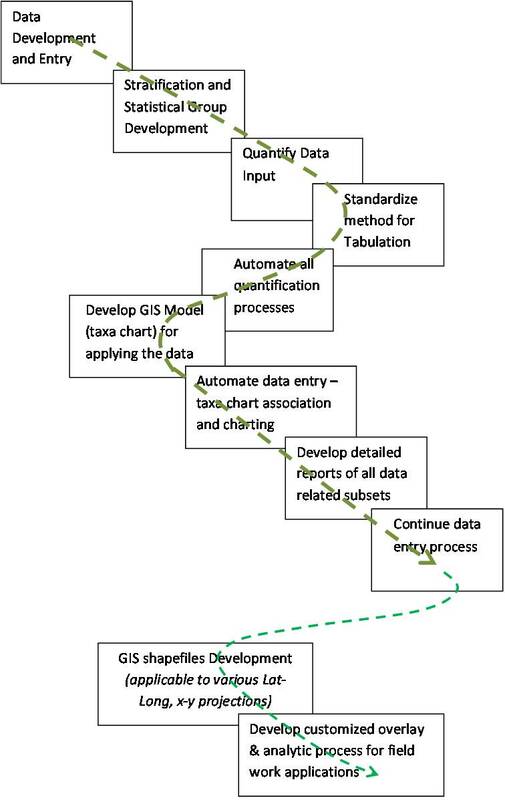 I then began prototyping the mapping methods for this data, and developed on that worked in GIS and one that did not use GIS at all. The latter is the one detailed on this page. I then determined how to best GIS this data. After producing some crude and rather basic GIS shapefiles for running this, including the use of a number of Avenue extensions, it occurred to me that this type of GIS product would be better if it could be made to run on its own within various projection settings. This way, the data could be projected wherever you wanted it in relation to the map you were working with on your screen. In other words, you could have you map visible on the screen and either just above it or below it this spatial dataform that you could project in order to see the plant evolution tree alongside other more traditionally GISed plant data. You could select on your GIS all the plants growing next to a lake, link these to the Ethnobotany tree, and see how these various plants and their natural products potential were distributed. The pages in the list at the end of this page were produced in order to provide examples of the outcome generated so far with this type of research analysis of plant uses and chemicals.